THE AMERICAN REVOLUTION DID NOT BEGIN WITH SHOTS FIRED FROM A GUN. The Revolution began much earlier, born of a growing discontent with a government that was unresponsive to the people’s needs, unrepresentative of the people’s views, and that denied its citizens their basic liberties. Though the seminal events of the founding of this great nation occurred over two centuries ago, many of the grievances verbalized by patriots such as Thomas Paine are again occurring; the fierce discontent emanating now from within America’s borders echoes the patriotic fervor of our founding fathers. The Revolution of 2010 examines the issues of today—such as freedom of speech, term limits, and God’s place in our country—through the lens of history, drawing heavily on the wisdom of our founding fathers. Author Carlos Cardoso urges Americans to get involved with government, at all levels, to ensure that American values and freedoms are respected and followed. 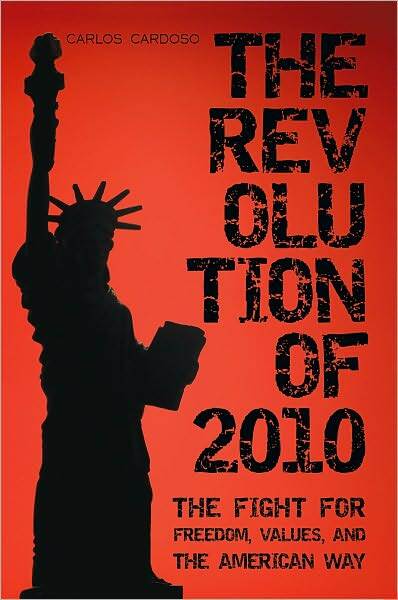 The Revolution of 2010 explores what it means to be an American and explains how, together, we can save this nation from the gathering dangers, both foreign and domestic, that threaten our liberty. If you believe the United States is headed in a wrong direction down a dangerous path, now is the time to act.